According to Hindu lunar calendar, the New Year comes with opening of the month of Chaithra and this first day is celebrated widely as the Gudi Padwa. This is a very special day for Marathi people. This feast is also well celebrated by the name of Ugadhi in Andhra Pradesh and Karnataka while Sindhis call it Cheti Chand. The real Sanskrit word for Gudi Padwa is “Chaithra shukla pradipada”. On looking into historical facts, Gudi stand for victory and prosperity. It symbolizes triumph of Lord Ramachandra over Ravana and is celebrated to venerate the coronation of Rama, the Lord after his exile of long fourteen years. Gudi Padwa is a mark of success and hence the Gudi which means the flag, is being held high. As per Brahma Purana, the universe was created on this day and so Gudi turns to be a symbol of Brahma’s dwaj or flag. Also Gudi represents the flag of Indra and is known by the name Indra dwaj. Gudi Padwa is celebrated only for a day on Chaitra Shuddha Padyami. Gudi padwa is followed at the last of the season of Rabi which points on to the end of one harvesting season and beginning of a newer one. Gudi padwa has a series of religious rituals which are very strictly followed by the worshippers. Gudi Padwa starts with an auspicious oil bath which relaxes the muscles and strengthens the body. Women as well as the children will work on mind-blowing rangoli designs with a wonderful burst of colors. They also decorate the home entrance with red flowers and mango leaves and creates a vibrant and colorful ambience. Once the decoration is over, comes the “Puja”. Lord Brahma is worshipped with "davna", a type of fragrant plant let and “havan” is offered to Lord Vishnu. Next is the most important part of Gudi padwa, which is the hoisting of Gudi. A yellow colored cloth adorned with mango leaves and red flowers is tied on to a bamboo stick onto which a copper or a silver pot is being fixed. This is what we call Gudi. It is then hoisted at a height either at the home entrance or in the terrace so that everyone could have a look onto it. Then "Panchangh Sharavan" will be there after which "Prasadam"will be offered to the listeners. 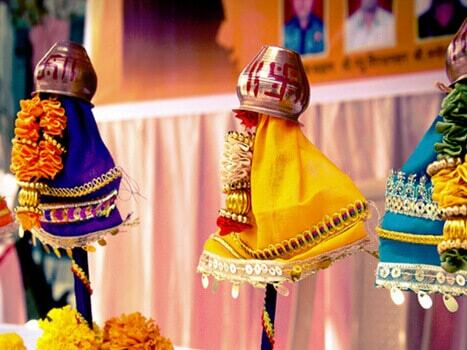 Gudi padwa continues to be one of the major festivals in India. It energizes the body and mind of the devotees and bequeaths them with all happiness and prosperity for the coming year.